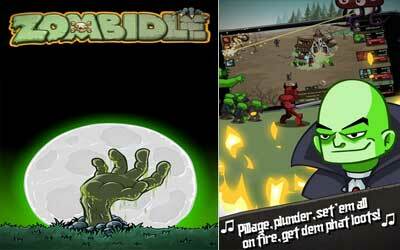 Zombidle APK has been released and current version is 1.0.164. Zombie game is still much in demand by gamers, but most of gameplay in zombie game play human character and kill the zombies. Some of zombie games are also use the role of being zombie and chased human, it seems more fun to be hunter rather than the hunted. This game is made by Berserk Studio which has gameplay idle and tap. At the beginning you will be prompted to log in to Google Play or still continue without Google Play but if any time something happens then the continuation of the games you play will lost. You will control the zombies here to destroy the houses. Surely not just one, you will be assisted by some zombie army consisting of witches and some troops that you can buy in the game. In addition you can also increase the level of the zombies that you have to get special abilities possessed by each zombie. Currency contained in this game is in the form of skull of village that you destroy. Achievement feature is not just the usual in-game awards Zombidle. If you penetrate achievement, the ability of zombies that you have will be increased. Starting from damage-per-sec and also damage per tap. You also can add to the damage both to upgrade it with some of the skulls. Level that you face is quite diverse, ranging from the village who had little village to difficult level. Quite simple and not complicated, without buying a diamond you can still be cool to play this game. Purchase some subterranean real-estate without filing the paperwork; yolo. I spend many hours playing it the first day i got it! It also feels very nice to be able to walk away and come back later to a bunch of points that accumulated from my minions. Great for the mid-game grind.